A strange and horrible thing happened on Halloween this year. Trick-or-treating in the neighborhood, as always, was awesome. If you live in D.C. and are looking for a place to send your children hunting for candy, I heartily recommend Friendship Heights. Nothing weird happened while trick-or-treating. We marched around everywhere and had a lot of fun, just like last year. No, the weird thing happened at a party after trick-or-treating was done. We had come home. We put my little girl to bed. I watched the third inning of the fourth World Series game with my boy (ah, such a hopeful inning) then put it on record. The boy and I then got in the car to drive down to a halloween party at a friend’s house in nearby A.U. Park. It was one of those parties where most of the guests were families with children but adults without children were also invited, in costume if desired. So we walk in, and the front room is filled with dancing kids, ranging from three to maybe 10 or 11. And across the room, standing there, is a man in a Adolf Hitler costume. I do a double-take, tell myself he must be dressed as Charlie Chaplin. But I am older and I was at a friend’s house with my young son. (Plus, I stopped wearing contact lenses around 2006.) So I go looking for the party organizer. I can’t get her alone, so I decide to leave. My boy and I get in the car and start driving home. No, can’t let this one go. Not gonna happen. I turn around; we go back inside. I find the woman organizing the party and this time I insist that I need to talk to her. I ask if there’s a story behind Adolf and his blonde wife over there. (The wife was not in costume.) She says no, friends of a friend. I tell her that I am going to ask them to remove the costume or leave. She says of course, but asks me not to make a fuss. I was surprised that there was no exculpatory backstory, because I would not have imagined that this friend would have permitted somebody into her house in an Adolf Hitler costume without one. So I go up to the gentleman with a sleepy three-year-old in my arms and tell him that he needs to remove the mustache or leave. He says (really) that I have no sense of humor. I ask him to explain the joke, he says it’s Halloween. I say — truly, I am astounding myself with my adult patience — that I have seen many funny comedies depicting Hitler and Nazis, but he is projecting no humor or satire, especially being a blond man from northern Europe. Surprisingly, I am as calm as the above sounds. I am of course paraphrasing, but I am not translating from Brooklynese. If he had been able to give me an explanation of why he had a point that didn’t involve making light of the man who caused World War 2 and the Holocaust, I would have been happy to hear it. His wife say, with exasperation, “There are vampires here!” I point out, obviously, that vampires aren’t real. He says, “Neither is Adolf Hitler anymore!” That deserves no response. At his point my patience has run out. I tell him that if he does not shave or leave right now I will ask one of the several black women at the party what they think. (There were no black men; the fathers, unlike me, were watching the World Series live.) He leaves. The lesson, if there needs to be one, is that neither Nazi symbols nor the Confederate flag should be taken lightly. A good rule of thumb is that if you are not in the Finnish Air Force nor a practicing Hindu, then anything resembling Nazi wear is best avoided. Unless you want to be politely thrown out of a D.C. Halloween party or less politely punched on a Mexico City street. I admit to being perplexed as why my friend did not tell the gentleman that he could not enter her house dressed as he was. I also admit to being perplexed as to why no one had told him to leave before I did. Christ almighty, no. No. No no no. Nazi Germany had no way of successfully invading the British isles regardless of the outcome of the Battle of Britain. First, the Royal Navy was in the way, not just the Royal Air Force. Second, on four occasions the British military waved away the entire Royal Navy and Royal Air Force in order to game out an invasion ... and in all four exercises the invasion collapsed with days. Click the link for Alison Brooks’ classic essay. The Nazis were able to drive hundreds of miles east and reach the outskirts of Moscow by October. But then Stalin was saved by the bitterly cold winter. The Soviets had more experience operating in cold weather and were better prepared than the Nazis. German equipment was not designed for below-zero temperatures, German soldiers were under-dressed, and they lacked essentials such as antifreeze. Germany never took Moscow. Second, Map 28 describes the Battle of Midway as a turning point, which it was in the sense of beginning the U.S. offensive ... but was not in terms of being key to a U.S. victory. By the summer of 1943 the U.S. had a wave of new carriers. Japanese-occupied Midway would be right on the doorstep of the main U.S. naval base. It would be thousands of miles away from Japan’s. The U.S. would be able to bomb it at will (as we did Wake Island) and rather rapidly starve out the survivors. The Marianas campaign might be pushed back to 1945, but by then the U.S. would have overwhelming superiority. And then the atomic bombs are ready by August. A later Marianas campaign might give the Soviets the time and inclination to occupy all of Korea instead of just the northern half ... which would make the Battle of Midway the turning point of a war that hadn’t even started. You could call the South Korea the big winner of that battle. But honestly, the implication that Operation Sealion could have worked is the real error. Not to take anything away from the Battle of Britain, which accomplished much, but keeping the Nazis out of London was not one of them. The old Air Ministry building in Berlin is quite impressive, if astoundingly ugly. Ironically, it missed damage from Allied bombing during the war. The Russians then ran their occupation zone out of the building. When they set up the puppet German Democratic Republic, the council of ministers occupied the old Air Ministry until 1961, after which it housed Communist bureaucrats. When East Germany collapsed and became part of the Federal Republic, it became the home of the Treuhand, an organization charged with privatizing most of East Germany’s communist economy. It now lies empty. Transport planes have broken down delivering weapons to Kurdistan and medical supplies to Senegal. Why even pretend to even have a military? There are few rational explanations for this. (Hat tip: Will Baird.) The story at the link is that President Martinelli of Panama told Chancellor Merkel that he would like to have the euro circulate alongside the dollar in Panama as legal tender. Seriously, he wants to be only country in the world with two currencies in legal circulation. But it was a very nice thing to say to Ms. Merkel. The video is below: Martinelli makes his proposal around 3:30 ... twenty seconds later, the Chancellor nods sagely. He goes on to say he has “complete faith in the euro.” I suspect that he was just trying to reinforce that point. Either that, or as Carlos Yu suggested, he is seriously pissed off about the Yankees. It appears that the German government has just announced that it wants Greece to renounce its sovereignty in return for more credit. (Well, at least in return for the release of existing credit lines.) The idea isnt new: in 2002, two prominent economists seriously proposed that Argentina give up its sovereignty for five years. Of course, Argentina has done quite well for nine years by breaking all the rules, but it is far from clear that Greece could copy that, or that Argentina will continue to do well. There is a historic parallel: the U.S. and the Dominican Republic in 1905. (Actually the U.S. and lots of Latin American countries, ranging as far afield as Peru and Bolivia, plus Liberia ... but let’s wait on that.) Short takeaway: Washington was way more generous back in those benighted days, with very little at stake, than Berlin is being today, despite massive repercussions for Germany if things go wrong. Thing is, it still took a while to build support, and there was, you know, an election to win. President Roosevelt didn’t agree to Morales’s request until December 1904, a month after the U.S. presidential vote. The Senate, it turns out, had other ideas. Roosevelt decided that with the election past, that wasn’t a problem, and so the U.S. took over the customhours without a treaty on March 31, 1905. Under the agreement, the U.S. directed 55% of customs revenue towards debt payments, but it did not do so mindlessly or automatically. Rather, it banked the money until February 1907, when it finally forced the D.R.’s creditors to accept a 50% haircut on their outstanding principal. (The average coupon was reduced to 5%.) In fact, if expropriation claims are excluded, creditors accepted a 57% haircut on their debt. And therein lies the rub. Or rubs. First, the D.R. was not a democracy in 1904; Greece is one in 2012. Second, the D.R. asked for the receivership; the Greek government is not. Third, the U.S. used its good offices to obtain a very favorable debt restructuring; the E.U. (meaning the Germans, really) is letting Greece hash things out with its creditors on its own. Finally, in the case of the D.R. the U.S. really was able to improve custom collection; I’m not sure that anyone believes that a foreign administrator will be able to easily improve the Greek internal revenue service inside a culture of widespread evasion. In other words, the U.S. was much more generous to its dirt-poor neighboring nondemocracy than the Germans are being towards their not-as-poor fellow democracy. Good luck with that. Unless, of course, failure is the plan. The basic problem confronting the eurozone right now is that the European Central Bank refuses to act as a lender of last resort. Outside Greece, most of the other countries are perfectly healthy as long as interest rates don’t rise too high. (Consider Portugal.) Of course, that’s the rub. As interest rates rise, debt levels start to look less sustainable. As debt levels start to look less sustainable, people sell their holdings of the debt. As people sell their holdings, interest rates rise. As interest rates rise, rinse and repeat. Normally, a central bank would come in and calm things down by promising to purchase new debt at a reasonable interest rate. This is why Britain and the United States have had no problems; everyone knows that their central banks stand ready. Eurozone countries, however, don’t have their own central banks. That makes them vulnerable to self-fulfilling panics. And here’s the second rub: Germany also lacks a central bank! So why should Germany be immune? To some extent, the country is protected by the fact that it’s the safe haven: when people sell other countries’ bonds, they buy German ones. But that’s only partial. Speculation has hit countries as healthy as Germany, like Austria and Finland. Considering as there still are other places to park your money (U-S-A! U-S-A! ), and the European Central Bank is still doing its level best to start a second Great Depression, then there is no reason why German bonds should be invulnerable to the panic. And lo! Germany just had a failed bond auction. Yields rose from 1.98% to 2.07%, far from a disaster, but not a good thing in economic terms. In fact, it is worse than you think. So what’s the silver lining? Simply that if Germany starts to be affected, then Angela Merkel will stop being evil. If that’s right, and it probably is, then we’re in trouble. But I’ll still say that on the margin we’re at least a millimeter closer to sanity than we were yesterday. This is (really not!) how European union ends: Germany awakes? It appears that Germany may be awakening to the disaster that would follow the collapse of the eurozone. Der Spiegel has an issue explaining the disastrous effects on Germany. They divvied them into actual costs (of printing up and distributing a new currency), export collapses, unemployment, and a loss of international power. The article lumps in the problems for Germany’s banks in the unemployment section, which is fair enough: the problem with having Germany’s banks take massive losses on their lending to de-euroized countries is not that the banks would lose money. It is that the resulting increase in risk premiums would cause a credit crunch, drive illiquid-but-solvent firms to the wall, and kill jobs. To be fair, it is much more likely that the euro would collapse as other countries peeled off in the wake of banking crises. So their first cost is a bit of a red herring, since even an extreme eurocollapse would certainly still leave a rump euro used by Austria, Finland, Germany, the Netherlands, Luxembourg, Slovenia, Slovakia, and (probably) France. That said, for Germany the costs of reintroducing would be small. That is not true for the countries likely to decide to leave the single currency. They would face massive adjustment costs. My friend Doug thinks they can be avoided. He is right ... if the banking systems in those countries have already collapsed. If the banking systems have gone under, then abandoning the euro is all gravy. The new central banks can reflate and keep domestic depositors whole, while the inevitable fall in the value of the new currency triggers an export boom. There will still be legal issues, since the governments of the countries with collapsing banks will have already likely imposed de facto capital controls (at the very least, a bank holiday of sorts), and that is against European law. But if the banking system is still alive, then the Eichengreen logic holds: the run-up to de-euroization would see the mother of all capital flight. Everyone and their second cousin tried to get their money out of the de-euroizing country. Yields on government debt would spike to impossible levels; likely debt auctions would actually fail. The result of that would be massive massive government cuts in the run-up: imagine workers paid in IOUs instead of cash. Finally, anyone with paper euros would hoard them, driving the economy back to barter. This all happened in Argentina. The reason why I think the euro is now 50-50 is that I can imagine things getting so bad that leaving the currency would in fact have few costs, but I want to be clear: the reason that it would have few costs is that they would have already been paid, not that they would not exist. Only the benefits would remain. If that is not correct, then I think there is an opportunity to make some money explaining why to the Irish, Greek, Portuguese, and Spanish governments. Over to you, Doug. One reasonable objection might be that Germany depends relatively little on the rest of the eurozone for its export revenue. (See the above chart for German exports in billions of current dollars.) In 2009, the eurozone took only 41% of all German exports. Moreover, much of the eurozone is likely to survive any crisis. The six countries whose new currencies are likely to collapse in the event of a breakup (Belgium, Greece, Ireland, Italy, Portugal and Spain) took only 17% of German exports. Those statistics certainly make it seem that Berlin could afford to let the European Union go hang. Except ... well ... Germany depends a lot on exports. Exports to the Notorious Six may come to only 17% of German exports, but Germany exported 38% of its GDP in 2009. Exports to the Notorious Six, therefore, came to 6.6% of German GDP. In addition, imports from the Notorious Six came to 5.0% of German GDP. Imagine, then, a devaluation that caused German exports to those countries to drop by a third, while imports from them rose equivalently. The total negative shock to Germany’s economy would come to 3.9% of GDP. That is, I think, quite large. Depending upon the multiplier, the shock could be even larger. Will German voters prefer to pay that price rather then pay to resolve the credit crises currently besetting (or threatening to beset) the Notorious Six? I do not know. I increasingly suspect that they would. Buckle up; we seem to be in for a rocky ride. I never held much truck with analysts like George Friedman, who believed that the European Union is doomed. Unfortunately, new facts have caused me to change my mind. One new fact, actually: the European decision to charge the Irish government a market rate on its “bailout” funds. WTF? Here is where I want to go out and shake a German: the IMF is the good guy in this story! You heard me right. The IMF suggested that Ireland basically default on the debt incurred to rescue the banks. That would be fine. Cut everyone’s debt level, let firms and individuals escape via bankruptcy. That would make it much easier to slash prices and wages without squeezing living standards. “Internal devaluation,” in other words. But the German government, the same government that (sensibly) wants private-sector haircuts after 2013 nixed the idea because its own banks are too exposed, and Berlin does not want to admit that its banks were as caught up in the foolishness as Irish ones. Instead we get a non-bailout bailout that does nothing to improve the situation and forces the Irish public to transfer 10% of its income to the rest of Europe for the foreseeable future. Maybe as the possibility of disastrous disorderly defaults looms ever-larger, German politicians will get their act together. A European version of the Brady bond is one possible solution. A raise in the ECB’s inflation target would help. Low-interest E.U. loans are a great idea. And a complete unification of European banking regulation (I suggest they just adopt Canada’s rules and be done with it) is long overdue. Internal devaluations made as easy as possible, reforms in the places that need it (of which Ireland is not one), and the dream of European unity held together. That looks ever-less likely. Instead we may get collapsing banking systems, chaotic defaults, German taxpayers bailing out German banks at high cost, and a reckless euro-breakup with horrible consequences for the world economy. It would also, as best as I can see, leave a residue of massive anger aimed, rightly or wrongly, at Berlin. I hope that I turn out to have been right the first time. Can somebody talk me down? Below the fold, Brad DeLong argues that what he calls the “Barrington Moore problematic” is no longer a useful way of ordering the social sciences. What is the Barrington Moore problematic, you ask? (Yes, I had to google the name.) In short, it is the search for the answer to why 20th-century states gave rise to regimes like Nazi Germany and the Soviet Union. In an advanced industrial society and a backwards industrializing one, regimes arose which killed millions of people. And even without those horrible ideologies, the First World War showed modern states using nationalism to mobilize for slaughter on an unprecedented scale. Understanding why drove research agendas for a long time; it certainly provided a useful way to organize undergraduate education. DeLong argues, with good reason, that this no longer dominates. Modern Western societies mobilize rapidly against even relatively mild forms of racism or authoritarianism. Other societies sometimes (but ever less) give rise to tinpot dictators or self-proclaimed socialists, but they are simply not the same. Al-Qaeda is not about to seize control of any state. Hugo Chávez may be leading an increasingly authoritarian regime, but he is no Joseph Stalin: he isn’t even a Fidel Castro. (Heck, these days even Fidel Castro isn’t much of a Fidel Castro.) And for all the attention to the threat of chaos, embodied by nihilistic terrorists or drug cartels, neither has really been able to do much damage inside functioning modern democratic states. We need, therefore, to find a new overarching question to bind together the social sciences. Except ... well ... in one field, economics, a lot of people believed that we had achieved a Great Moderation. Depressions were a thing of the past. Well, not so much. In political science, many believed that we had a pretty good handle on what politics looked like under first-past-the-post. Again, not so much. Do we really understand why the world hasn’t been turning up many Stalins lately? Are we sure that Communism and facism and future things like them are dead? Is it in fact time to abandon the study of dictatorship and democracy because things look like okay, right now? Well, probably yes. That said, I worry that in a few years or decades the below essay (under the fold) just might (perhaps) look a little bit like the literature on the Great Moderation, or the Westminster system, or worse yet the positivism that preceeded the First World War. Maybe, just maybe, after the resurgence of problems that so many thought were dead, we just might not yet want to abandon the search for the roots of totalitarianism. And it sure wouldn’t hurt to keep undergraduate education focused on it. One the potential points of confusion between historians and non-historians is that when historians say something like “history matters,” they do not mean “people today bear history in mind when making decisions.” Rather, they mean “past events constrained (or even caused) present decisions.” This subtle difference has caused confusion between my friend Doug and myself on multiple occasions. The confusion is clearly my fault, for the simple reason that if you confuse somebody, you are by definition being confusing. Since the memory of the war is indeed alive and well in many places outside Germany (and I know at least two Germans who have been unpleasantly blindsided by this fact) it is a good thing that most Germans have a hypersensitive reaction to any intimation that they might use military force in response something short of a direct attack on NATO soil. Let’s take it from the top. The German Constitution specifically prohibits “Angriffskriege.” That translates as “offensive war,” but the meaning in German is a bit broader. “No Angriffskriege” pretty much precludes anything but self-defense. Note that the Germans didn’t put this provision in themselves! The Allies insisted — almost literally at gunpoint — that it be included. The initial German reaction to this was something like “glum resignation.” But over time, they got more enthusiastic about it, and today it’s as important — and as central to their identity — as any provision of the Bill of Rights is to Americans. Anyway: just a few years after its drafting, the restriction hit its first snag: how could it be reconciled with German membership in NATO? Answer: NATO formally assured the Germans that this alliance was strictly defensive. The Bundestag then solemnly passed a law saying “the Constitution allows us to join defensive alliances”. Subsequent court decisions confirmed that, okay, this was constitutional. This was back in Adenauer’s time, when the judiciary was pretty conservative and inclined to defer to the executive on security issues. It’s anyone’s guess if it would have flown a generation later. But fly it did, and 50+ years later it’s firmly established as both precedent and policy. The odd result of this is that NATO occupies a special constitutional space. Basically, if NATO does it, it’s presumed defensive — not Angriffskrieg! — and therefore constitutional. This in turn provided a precedent for German participation in Afghanistan. Again, it was limited — no German troops storming Taliban strongholds. Arguably the Germans could legally do this, but the political leadership wisely decided not to stretch the envelope. Germany has an extremely strong self-image of itself as a nation that is peaceful and law-abiding. Obviously that has historical roots in the postwar settlement imposed by the Allies, but it’s comfortably outlived both the war and the settlement and is now a historical fact in its own right. The last withered, centenarian WWII veteran will probably drop dead around 2035, but the Germans of that day will almost certainly still be pacifistic and inclined to hand-wringing over most forms of military action. Events six decades ago constrain current actions, even without the direct consideration of the actors. History matters, even when unremembered. The president didn’t say that the deployments in question would have to be unilateral, just that they would have to be. (The country in question does indeed have troops in Afghanistan, Bosnia, Lebanon, Kosovo, and Sudan.) The reaction is ostensibly over the implication that Berlin has troops in Afghanistan to keep trade routes open, but that idea is so obviously ridiculous that it is hard to believe that it is actually the root of the controversy. If you are expecting me to speak badly of the political reaction to the comments, think again. Despite Angela Merkel’s wishes, history weighs heavily on many foreign views of the Federal Republic. I know Germans who have been dismayed to discover this. That history, however, means that it seems to me entirely appropriate, even heartening, that the President came under such a firestorm. I would call anyone who denounced such an obvious comment in the United States an idiot. I would not have a whole lot of respect for someone in, say, Canada or France or Brazil who said likewise. But for better or for worse, Germany has a different burden than Canada or France or Brazil. By the way, Germany won the Eurovision song contest! Who knew? That the Eurovision song contest was underway, that is. I didn’t. Why oh why oh why would Germany leave the eurozone? That said, being obscure has its downside, especially since nobody will answer your question: why would Germany want to leave the eurozone? Edward Hugh said it again. Others have intimated it. But nobody explains why this would happen! Now, I know Ed is important and all these days, but I really would like to know why this logic is wrong. C’mon, Ed, somebody, help a brother out. Alex, can you poke him again? I've already mentioned how German public opinion about the economic crisis in southern euroland annoys me. “Poor naïve Klutzes” my foot. The truth is that Germany has greatly benefitted from being able to force its eurozone partners into a monetary policy that generated speculative bubbles and drove up their price levels. A nice essay on the topic can be found here. One thing that I do not understand are the strange allusions that Germans might benefit from leaving the eurozone. Their exchange rate would rise, making their exports uncompetitive and reducing the value of their substantial holdings of foreign assets. I suppose that those assets, denominated in euros, would be a bit safer at the new values ... but I am still not seeing it. I do not know if Spain can survive inside the strictures of the eurozone. I suspect that it can, but I do not know. I certainly am beginning to revise my priors on the worth of the single currency. That all said, I still find the sanctimonious German attitude most annoying. The bailouts will not cost the German taxpayer a nickel, the PIGS will be forced to reform their labor markets, and Germany will continue to enjoy the benefits of export competitiveness for several years to come. The worst thing that could happen to Germany would be slightly higher inflation ... and that would be a good thing for German pocketbooks, if not for Germany’s pathological public opinion. I mean, when the head of the Austrian central bank calls German inflation fears “hysterical,” then something is wrong. Slate is running a travelog about an American's trip through Germany's “eco-empire.” I have to say that TPTM got there first. Anyway, as I was reading it, I came across two moments that startled me. The first was when our protagonist's Dutch-Bolivian travelling companion praised Mein Kampf. This doesn't surprise me at all from the Bolivian side. Mexicans aren't Bolivians, but I've heard middle class Mexicans say “At least he organized the youth,” in praise of Hitler, and I've seen young female middle class Mexicans reading and speaking well of Mein Kampf in upscale bars. But ... the woman in the Slate piece was half-Dutch, and the author gave the impression that she had been raised in the Netherlands. So either I'm in denial about Dutch culture, or the author should have specified that his female friend was much more Bolivian than Dutch. I knew this E.U. custom: Jam all your languages into a sentence and let the other person answer according to their preference. I have never come across this. Now, admittedly, most of my E.U. experience has been in the Romance zone, which may be different. But is this really an E.U. custom? Information wanted, please. Flying into Berlin, you can't help but notice the wind farms. 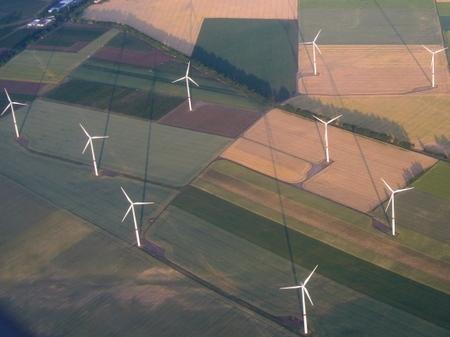 Germany has 22.2 gigawatts of installed windpower, just a percentage point shy of a quarter of the world total, and a third more than the United States. It gets more than 6 percent of its electricity from windpower, a number matched only by Denmark and the great state of Texas. Inside Germany, the mouthful provinces of Sachsen-Anhalt, Mecklenburg-Vorpommern, and Schleswig-Holstein get almost 30% of their electricity from wind. How did Germany do it? How far can they go? Will others follow? Some analysis below the fold. No, not the sixth game of the NBA final. That was awful. (I wasn't rooting for the Lakers, but I'm not much of a Celtics fan either. So something other than a blowout would have been nice.) Rather, das wunder von Genf, the match between Turkey and the Czech Republic. Down two-to-nothing, one goal with 25 minutes to go ... then two more in the last four minutes. Dude. I have to admit that we wouldn't have bothered to watch it at all if we hadn't been walking past a Turkish bakery-slash-café-slash-bar in Kreuzberg next to what certainly appeared to be a housing project. I couldn't stop myself from looking in through the window at the giant flat screen. Any kind of team sporting event involving a ball will do that do me. The people inside spotted us and vigorously motioned us in. In fact, one of the owners came out and insisted (through sign language) that he could find us a seat and we were more than welcome. How could we say no? After all, the game had only just begun. And so, we had the full build-up of frustration that only soccer can produce by the time Ay-Yıldızlılar first scored. Apparently shouts of gooooooooooooolllll, go-lo-lo-lo-looooooooooooooool!" aren't a common German or Turkish way of expressing appreciation. I judge this from the fact that when Turkey scored its first goal, my reaction attracted looks from some of the women in the place that I can only describe as bemused. I'll add here that neither high-fives nor fist-bumps appear to be used much either. But the little kids in the place, and there were a lot of them, certainly seemed to appreciate both gestures, especially after Turkey's second goal. The woman in the above picture who isn't my wife asked me if I was Muslim right after the game. Before I could answer, the fellow on the right barged up and shouted, "In football, there is no religion!" By the amount of beer-drinking going on, I'd have to say that he was right. The owners gave us free pastries. (We paid for the beer.) They were great pastries. Very recommended, the next time you're in Berlin. Anyone know a good place in Boston to watch the Turkey-Croatia match? Y'all know who I'll be rooting for. ¡Viva Turquía!